When I’ve looked for new bikes for myself, the first parameter I use to weed out potential choices is head tube length. I don’t think I ride a very extreme position, but I do ride a small frame. Though it is true that taller riders typically ride with more saddle-handlebar drop than shorter riders, I think that manufacturers have over-compensated. 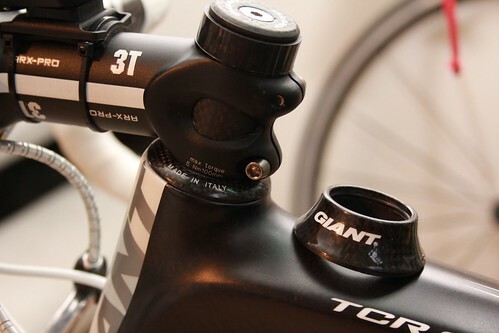 For instance, Ridley bikes have a 130-135mm head tube (integrated) on their smallest frame. Ridiculous. Orbea has a 105-110mm integrated head tube on their smallest bikes, which looks nice for me since I can use an 80-84deg stem, maybe with a 5mm spacer underneath. At 115mm, I need a 73deg stem slam on the headset bearing cap. 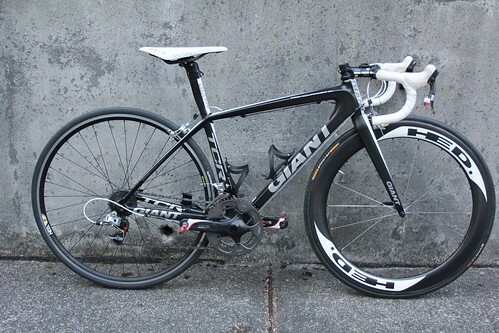 Until recently, I rejected Giant’s newest carbon bikes because they have 120mm head tubes; I don’t want to have to use a 67deg track stem on my road bike. Then I found out that the TCR Advanced SL uses the Campagnolo Hiddenset standard for the top of the head tube. Here you can see that I’ve replaced the stock bearing cap with a Campy piece (I’ve actually gutted it so it’s just the wafer-thin carbon). That saved about 10mm+; enough so that I can just barely get the handlebar where I want it with a 3T 73deg (negative 17deg) stem. So now I’m in business. I’ve always liked the radical sloping top tube that Giant pioneered on road bikes back in the 1990s, when Mike Burrows designed the Compact TCR for the Taiwanese bicycle company. Commonplace now, Giant compact frames were daringly different back then but have since influenced almost all the high-end road bikes. For me, the Giant TCR directly inspired the custom road and track bikes (Sycip, Davidson) I have designed for myself and others. When I was considering a new carbon bike, I really liked the latest TCR Advanced SL, and solving the headset/head tube stack issue was the last technical hurdle.